Farming is continuing to spread in Mexico. 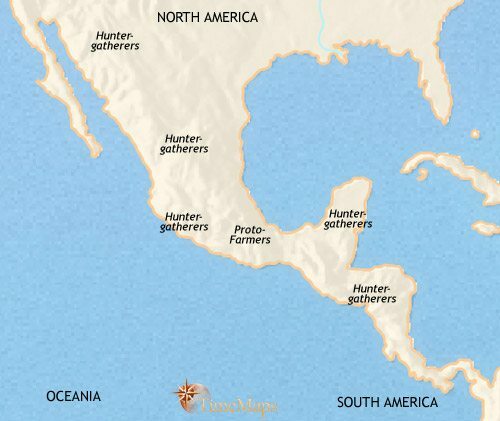 In Mesoamerica most people are hunter-gatherers. Farming is spreading in Mexico. The Olmec civilization has appeared in Mexico. The Olmec civilization has expanded over a wide area. The Olmec civilization is in decline, new civilizations are rising. The Mayan civilization is now flourishing. The Mayan civilization is now reaching its peak. The Mayan civilization is now at its height. The Mayan civilization is now in decline. The Mexica people are rising to prominence. 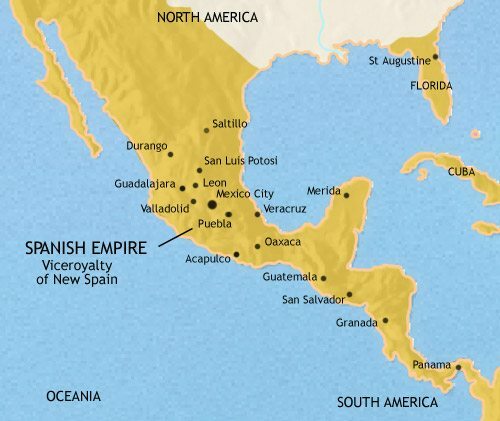 Mexico and Central America are now part of the huge Spanish empire. 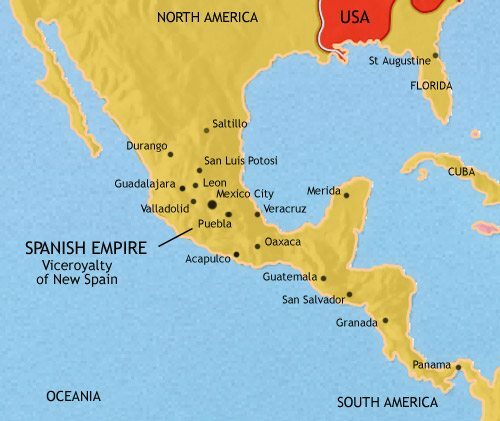 Mexico and Central America belong to the huge Spanish empire. 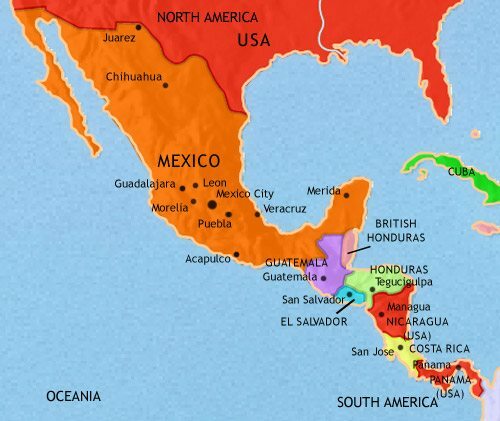 Mexico and Central America are now independent from the Spanish empire. 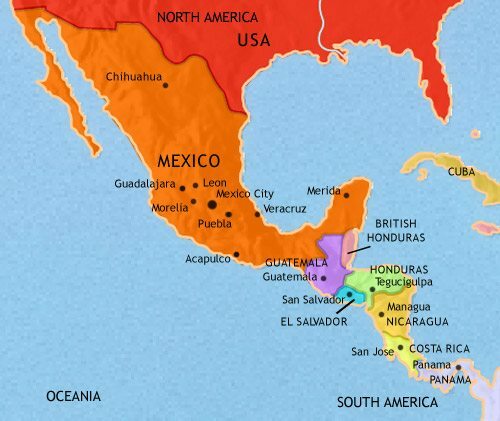 Mexico has lost a huge amount of territory to the USA. The Panama Canal has been built. Most countries of Mexico and Central America have been ruled by dictators. Mexico, though troubled by a major drugs war, is experiencing strong economic growth. By this date farming is well established in Mesoamerica, with the fully-developed domestic maize as the staple crop. Farming villages are located mostly in the west of Mesoamerica, and on the coast of the Gulf of Mexico. Also, farmers are beginning to colonize the central Valley of Mexico. On the Gulf coast in particular, large villages are developing, as the people (known to modern scholars as the Olmec) learn how to take advantage of the fertile soil of the rivers and coasts by digging ponds and channels to control the flow of water to best advantage. Elsewhere in the region the hunter-gatherer lifestyle remains the norm, and it will only gradually give way to farming. The peoples of Mesoamerica originally came from the north, many thousands of years before. Most are hunters and gatherers, living in small, temporary settlements as they move regularly from location to location in search of game and forage. However, there are some small scattered communities which are making the transition from hunter-gathering to farming. They grow such crops as beans, manioc and yams, and some maize – though this is not an important food source, probably because the fully domesticated plant has yet to evolve. They rear turkeys and dogs for eating. As well as growing food, hunting and gathering provides a large part of their diet. Farming communities are gradually spreading across present-day Mexico. At the same time, these communities are placing increased emphasis upon growing crops and rearing small animals for their food, at the expense of hunting and gathering. This development is linked to the slow development of fully domesticated maize, which are easier to harvest and a great deal more nutritious than the wild varieties. At this time, also, the first pottery appears in Mesoamerica. 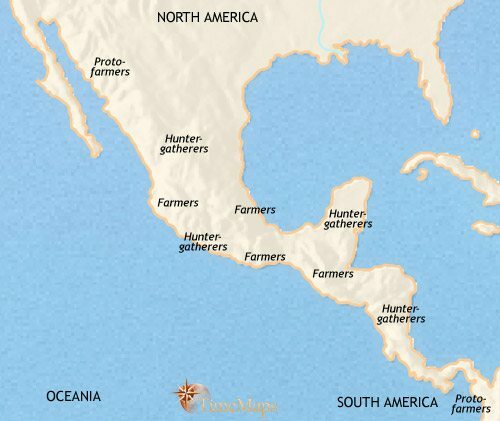 Nevertheless, throughout Mesoamerica most of the population remains at the hunter-gatherer level of subsistence, and some areas which would later play a predominating role in the development of Mesoamerican civilization, such as the Yucatan Peninsula and the central Valley of Mexico, were very thinly populated at this date. In the coastal lowlands of Mexico, the rich soil of the river mouths has allowed intensive farming to give rise to a dense population. Here, elite groups have emerged who are able to control the labour of large numbers of farmers, and a more complex society has come into being. With this labour at their disposal, the rulers build imposing ceremonial centres, adorned by superbly-crafted sculptures and other works. These centres act as the focus for the religious life of the region, and from them the rulers are clearly able to exercise a high degree of control over the surrounding countryside. Thus what many scholars regard as the earliest civilization of Mesoamerica has emerged, that of the Olmecs. Complex societies are also evolving in other parts of Mesoamerica, though not on the scale of the Olmecs. 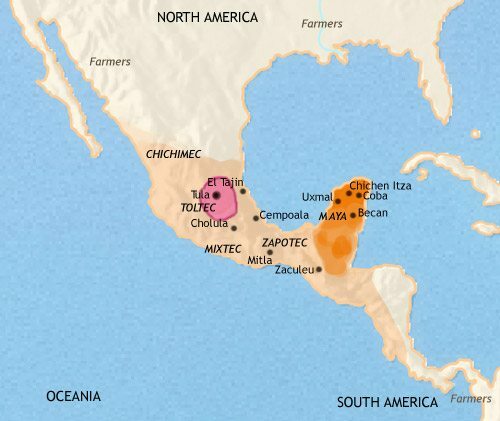 Trade routes now span the region, and along these Olmec influences reach out throughout the region, laying the foundations for all future Mesoamerican civilizations. 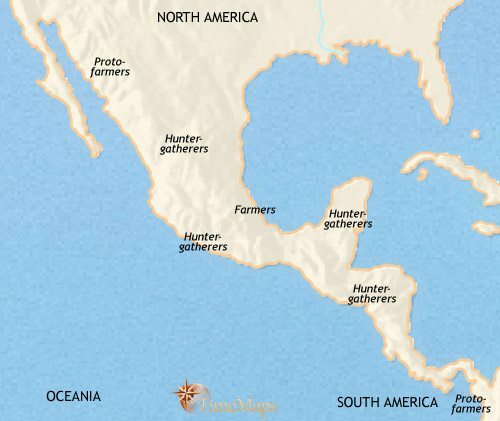 Hunter-gatherer populations still inhabit much of the region, and it is only about now that the lowland forests of the Yucatan Peninsula, the later heartland of the great Mayan civilization, begin to be settled by farmers. The Olmec have expanded their cultural influence over a large area of Mesoamerica. They have pioneered distinctive features of Mesoamerican civilization – stepped pyramids, the production of beautiful ceremonial objects, priestly authority, a complex pantheon of gods and the mysterious ball-game arenas. One of the unique Olmec features, however, is the carving of enormous basalt heads, probably representing local rulers. By this date at the latest the greatest of the early Olmec centres, at modern San Lorenzo, has experienced a mysterious fate: its sacred sculptures have been deliberately desecrated and buried, and the ceremonial centre deserted. Other Olmec centres continue to flourish, however, and the Olmec trade networks have continued to expand. Other centres of civilization with non-Olmec characteristics are also emerging, revealing that other peoples are being influenced by the Olmec but not absorbed by them. This process, of widening influence but not absorption, is laying the foundations of Mesoamerican civilization on which successive peoples will build in the future. By this time, the centres in the Olmec heartland are in decline. Several of them have experienced the mysterious fate of having their ceremonial structures and objects deliberately and elaborately desecrated, and their central areas deserted. 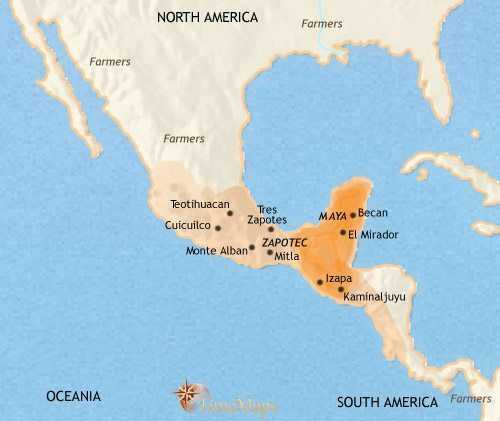 Elsewhere in Mexico and Mesoamerica, other centres, such as those of the Zapotec, the Mixtec and the early Maya, continue to develop. Indeed, this is a period of strong population growth, especially in the Mayan heartland of the Yucatan lowlands and in the central Valley of Mexico. 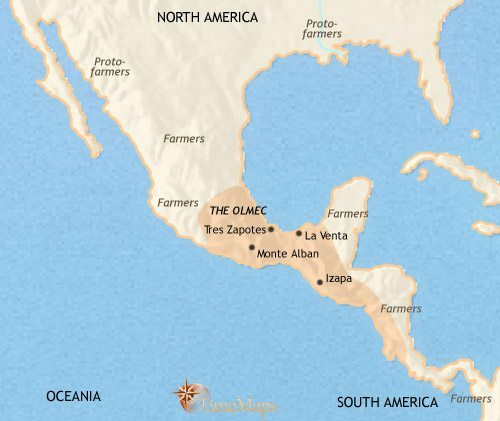 Some centres are growing into the earliest cities of Mesoamerica, most notably at Monte Alban, in the west, and Teotihuacan, in the Valley of Mexico. As well as physical expansion, these Mesoamerican societies experience continued cultural advance. Almost certainly by this date the first writing system has been developed, and the highly sophisticated Mesoamerican calendar, which involves two separate but inter-meshing dating systems, has appeared. Strong population growth continues to affect the region, and cities continue to grow, in number and in size. The early Mayan city-states have begun to emerge, and urban society is developing on the western coast, amongst the Zapotec people. It is in the plateau of central Mexico, however, that the most dramatic development is taking place. Over recent centuries, a large farming population has become established here, taking advantage of the fertile volcanic soil and the system of lakes and streams with their plentiful supply of aquatic food. On this base, several large states emerged, their capitals dominated by pyramid mounds. From c. 300 BC, however, a major city suddenly appeared to the north, Teotihuacan. This now probably houses as many as 60,000 people and dwarfs any other urban settlements in area (and indeed, in the entire New World). This indicates that its ruler has eliminated the other states; the new city has certainly drawn in the populations of the older capitals, and it will continue to grow in the future. 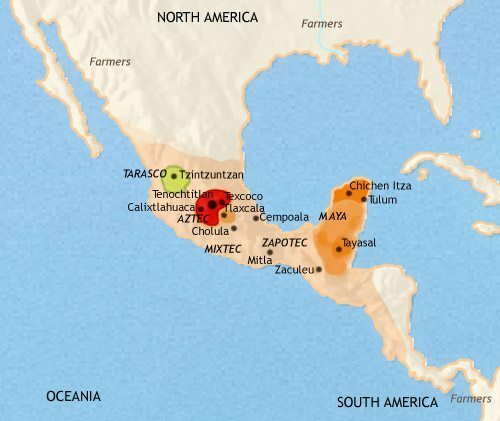 A widespread network of city-states spreads over Mesoamerica, all sharing common cultural traits but each region bearing distinctive features. In the Yucatan Peninsula, a group of city-states are developing which will, over the coming century, become the home of the classic Mayan civilization. Some of these are already large cities by this date, major centres of high culture. Most dramatically, a huge city, one of the largest in the world at this time, has appeared in the Valley of Mexico. Teotihuacan has a population of some 150,000-200,000 people by this time. It is sustained by an intensive system of irrigation agriculture, and has sucked in the population from a large area of the surrounding country. The centre of the great city of Teotihuacan has been remodelled on an imperial scale, with the huge pyramids of the Sun and the Moon the centrepieces. Teotihuacan continues to thrive. The great city exercises an influence which extends throughout the length and breadth of Mesoamerica. To what extent this is based on commercial ties or military power is unknown – no records have survived, even though this is a literate civilization. In the lowlands of the Yucatan Peninsula the Mayan city-states have now reached their classical period. Teotihuacan exercises a strong cultural – and perhaps political – influence in the region, but the Maya are developing a mature, vibrant civilization of their own, which will soon experience the greatest cultural flowering in Pre-Columbian American history. At about this time Teotihuacan is destroyed, after a century or so of decline. Temples are violently desecrated, monuments thrown down, and the entire city torched. In the aftermath, the Valley of Mexico is divided amongst several small city-states, each vying for Teotihuacan’s inheritance. On the Yucatan Peninsula the Mayan civilization continues to flourish. The city states compete with one another both militarily and culturally, stimulating a very high level of artistic achievement in sculpture and architecture. In mathematics, they are more advanced than most peoples of the Old World at this time: they understand the concept of zero, and use a numeration system based on the same principle as decimal places. They also have an extremely accurate calendar, and a mastery of the science of astronomy. In the Valley of Mexico, the Toltec have established their dominance. Their capital, Tula, whilst not matching Teotihuacan in size, has nevertheless grown to be a very large city. Like the people of Teotihuacan before them, the Toltec exercise a widespread influence – and perhaps a measure of military dominance – throughout Mesoamerica. The memory of Tula will have a deep influence upon the imagination and beliefs of the later Aztec people. In the 9th century many Mayan city-states experienced a sudden collapse in population, while others went into steady decline; many of the historic cities of the Yucatan lowlands now lie abandoned. This may have been due to environmental decline, probably the result of an unsustainable level of population density. In the north of the Yucatan Peninsula other Mayan cities continue to flourish. Uxmal rose to control a large territory in the 9th century, but its power has recently been eclipsed by that of Chichen Itza. The latter evidently has close links with Tula, in the Valley of Mexico. After ruling the most extensive empire in Mesoamerica’s Pre-Columbian history, the Toltec empire has ceased, their capital, Tula, sacked (1156) by a people from the north, the Mexica. 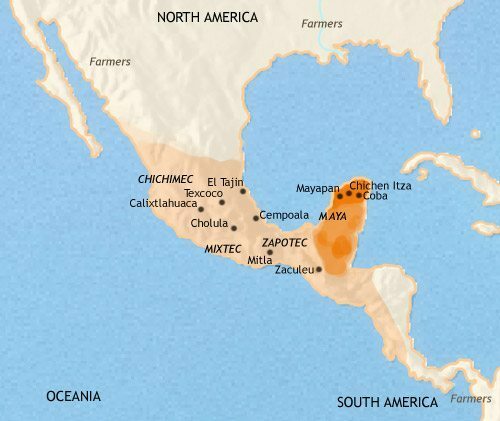 According to their foundation-legends, the Mexica, the forebears of the Aztec, were one of a number of peoples who came into Mesoamerica from the north in the 12th and 13th centuries. They have established themselves on a swampy island in Lake Texcoco, and serve as mercenary soldiers for the competing city-states of the area. The period is a fruitful one for a band of mercenaries. Central Mexico is now the setting for internecine warfare between numerous city-states. Incoming barbarian peoples such as the Mexica complicate the situation, allying themselves now with one, now with another of the older states, and disrupting the more established urban societies of the region. In the old Mayan homeland of the Yucatan Peninsula, Uxmal fell into decline after c. 1000, leaving Chichen Itza as the undisputed leader in the north. This was also a trading centre, with strong commercial links to the Gulf coast and central Mexico. Through Chichen Itze Mexican cultural influences spread through northern Yucatan. Mesoamerica continued to be fragmented amongst numerous tribes and city-states during the 13th and 14th centuries. Then, in the 15th century the Mexica people became the leading element in a new alliance of peoples, the Aztec. Since then this group has been busy extending its power over its neighbours. The Aztec now dominate the Valley of Mexico. Their capital, Tenochtitlan, is already a huge city, perhaps 150,000 strong – very much larger than most Old World cites of the time. The Aztec conquered a large empire covering much of Mexico and Central America, before they themselves were suddenly conquered by a small band of Spanish soldiers, under the command of the conquistadore, Hérnán Cortes. Arriving in Mexico in 1519 with 200 men, Cortés had completed the conquest of the country by 1522 -an achievment only made possible with the aid of the Aztec’s many native enemies. With Mexico and the other countries of Central America under their control, the Spanish seized the land and distributed it amongst themselves. As for the native population, millions died from the diseases that the Europeans brought with them, to which they had no immunity. Most of the rest find themselves reduced to serfdom on huge estates owned by the conquistadores, called encomiendas, The great cities of the past are deserted and left to crumble away, to be rediscovered centuries later. The Catholic church has taken control of the spiritual life of the inhabitants, and the old religions remain only as part of the strong folk tradition of the native Americans. The viceroyalty of New Spain is an enormous administrative division of the Spanish empire. It comprises all of present-day Mexico, plus most of central America and the western parts of the present-day USA, as well as the Philippines. The colonial societies that have arisen in the Spanish-ruled lands of Mexico and central America are extremely hierarchical ones. The demarcations lie largely along racial lines. At the top are the Spanish-born officials and soldiers, who monopolize all senior positions in the service of the Spanish crown. Beneath them are the creoles – people of Spanish descent but born in the colonies. Many of these are descended from the original conquistadores, and own the vast landed estates assigned to their ancestors. Below them are the mestizos, of mixed Spanish and Indian blood, who fulfil the more menial roles in the economy. Finally, at the bottom, are the native Indian populations. The great majority of these work as landless peasants for creole landowners. A popular rebellion against the Spaniards began in 1812 and Mexicans won independence in 1821. The following year the new leaders introduced a constitutional monarchy, with Agustin de Iturbe as Emperor. Less than a year later Iturbe was driven from his new throne and executed. Since then the country has been under the rule of the military dictator, Santa Anna. Under him, Mexico is governed by the creole landowning elite, with the support of the Catholic Church. The Indian peasants see very little change from their former situation under the Spanish. Santa Anna ruled Mexico, with the support of the military, the landowners and the Church, until 1858. His rule saw defeat at the hands of the USA (1848) and the consequent loss of huge amounts of territory. His successor, Benito Juarez, was determined to bring about improvements for the people, and issued a law separating Church from state and nationalising Church lands. Unfortunately for the Indian peasants, these new lands were quickly bought up by the wealthy. Owing to outstanding foreign debts, French forces invaded in 1861, and set up an empire of their own, with prince Maximilian of Austria on the throne (1864). In 1865, however, the USA threatened to intervene if the French did not leave. The French army thereupon withdrew, and Maximilian was executed by the Mexicans in 1867. Mexico has since experienced several years of chaos. 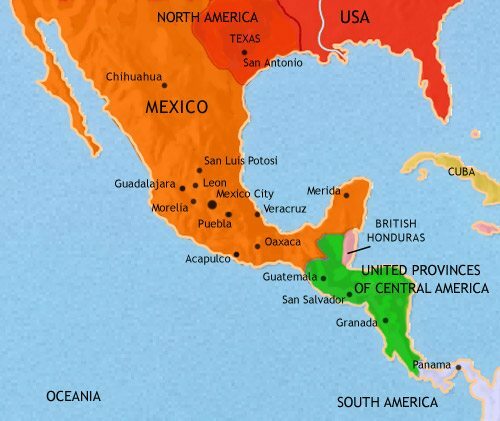 To the south, the United Provinces of Central America fall apart in 1838, and Guatemala, El Salvador, Honduras, Nicaragua and Costa Rica went their own ways. In the years that followed, US and European companies developed canals and railroads in the isthmus. Their business interests are matched by increasing political meddling in the affairs of the region, which promotes political instability. After several years of political turmoil in Mexico, Porfirio Diaz became dictator (1877-1910). He set about an ambitious programme of modernization which brought benefits to some sections of society. However it deprived the majority of peasants of the land rights they had previously enjoyed. At the same time Diaz’ regime became mired in corruption. Revolutions broke out, and Mexico has descended into chaos. This is the era of Pancho Villa and other Indian revolutionary leaders. In Central America, the late 19th and early 20th centuries have seen US business involvement in the region grow. Large US companies dominate the coffee and banana industries, which have now become vital parts of the economies of the region. The companies have manipulated local politics to their benefit, crushing labour unrest and acting as a stifling monopoly. On occasion they have even instigated direct military involvement, with some countries, notably Honduras and Nicaragua, being occupied by US troops for years at a time. After costly attempts to build a canal across the isthmus of Panama, the US secured the right to control a swathe of land known as the Canal Zone, and to complete the canal. The canal is opened this year, 1914. After several years of chaos, Venustiano Carranza seized power in Mexico and carried through important social reforms, particularly land redistribution. After his assassination in 1920, his work was continued by his successors, presidents Obregon (1920-24) and Calles (1924-8). Reformist governments continued to bring about much-needed changes in the country, above all under presidents Lazaro Cardenas (1934-46) and Valdes (1946-52). In Central America, the US dominance of the region – economic, political and military – provoked guerilla activity, later to bear fruit in the Sandanista movement in Nicaragua. The Great Depression of the 1930s led to even higher levels of instability, including war between Guatamala and Honduras and the coming to power of dictatorships in most of the countries. Since World War 2 the social and political turmoil of the region has turned it effectively into a battle ground between the rival superpowers, the USA and the USSR, with scant regard paid to the interests of the common people. For Mexico, the 1970s and 80s are dominated by oil boom and bust. These lead to a period of political instability in the 1990s and to insurrection on behalf of the many still-dispossessed Indian peasants. In recent years, however, the Mexican economy has been expanding, and prosperity has been reaching ever larger sections of the population. The greatest problem for Mexicans is the growth of the drugs trade, which is reaching such levels that certain areas of the county are becoming ungovernable. In Central America, the social and political turmoil of the region continued, with repressive regimes stimulating violent opposition. It is only with the end of the Cold War that peace gradually returned. In the wake of peace has come democracy, which now predominates, though political violence and human rights violations, together with widespread poverty, remain a problem.